John Philip Santos preparing for Thursday's groundbreaking ceremony at Fox Tech High School in San Antonio. Thursday night, San Antonians celebrate phase one of the San Pedro Creek Improvements Project with a groundbreaking ceremony. The $175 million county-led effort should be ready in time for the city’s 300th birthday. Right now, San Pedro Creek is a concrete drainage ditch that runs along the western border of Downtown San Antonio. It’s not much to look at. Spilling over a dam of sandbags, it loudly burbles and splashes. But to writer John Phillip Santos, the creek sounds more epic. So much so, that Santos wrote an opera about San Pedro creek’s history—with composer Joseph Julian Gonzalez. They created the work as Bexar County and the San Antonio River Authority plan the waterway’s bold makeover. "The opera in a sense is a reminder that we are a cosmic city with ancient origins—a place where people have come from all over the world and made a new kind of culture, a mestizo culture," Santos says. Santos says the story of the creek is the origin story of San Antonio. "The city’s story in many ways begins actually at San Pedro Creek with some of the first interactions between Spaniards and indigenous and the first settlements took place here around Camaron and Santa Rosa. So, this is a place that in a sense we’ve forgotten how pivotal it was in our beginnings," he says. The improvement project aims to once again make the creek a place where San Antonians gather. The plans call for a new linear pedestrian park, with 11 acres of landscaped area and four miles of walkways. Precinct 2 County Commissioner Paul Elizondo says it will be unlike other recent river revamps in the city. "It’s not another River Walk. It’s much different in nature. It’s not a duplication of the Museum Reach or the Mission Reach. Those are for tourism and other things like that," Elizondo says. Elizondo says San Pedro Creek is for locals. The existing creek channel will be widened and deepened, bringing 30 acres of land around it out of the 100-year floodplain. So, properties along the creek can be developed. "This will be hopefully to re-generate economic development with a lot of apartments and locations where there can be mixed use of business and residence all along the creek in order to spur that," Elizondo says. Aside from flood protection, the creek makeover will also improve water quality and restore aquatic habitat. The San Antonio River Authority is managing the project. General Manager Suzanne Scott says most of the work should be finished in time for the city’s May 2018 tricentennial. "What you’ll see in this transformation is going from a channelized drainage ditch into something that will have beautiful landscaping, wonderful walkways. It will also have water features. They’ll be places of respite where people can sit along the creek and enjoy just being there in this wonderful environment," Scott says. Scott says she’s working with permitting agencies to speed up the review process and stay on schedule. The project will be difficult, she says, because the creek runs through a pretty busy part of Downtown. "Even though this may be more challenging, it’s worth doing. And it’s important for us to be able to celebrate our culture and bring this San Pedro Creek back to life," Scott says. Scott says there will be plenty of public art along the creek—and John Phillip Santos worked with designers to display historical information as well. So we are setting a stage for an immersive experience in San Antonio history that—I don’t think there’s anything in the world that has these kinds of echoes, Santos says. The first act of Santos’ opera—“Las Fundaciones de Béjar”— will be performed at the San Pedro Creek groundbreaking Thursday evening at Fox Tech High School. San Pedro Creek is about to see big changes and the city and county are going to be shelling out big bucks. Bexar County alone is putting in $175 million to turn the West Side creek into a green belt of running trails and parks. The hope is that the improvement will lead to additional business investment in the West Side according to Bexar County Judge Nelson Wolff and Paul Elizondo, the Precinct 2 county commissioner, whose district covers the West Side. San Antonio's San Pedro Springs Park, the second oldest city park in the United States, is getting some needed updates. The city is spending $1.8 million to create a perimeter trail with LED lighting, additional signage and monument walls. The improvements were identified by residents in the 2013 Master Plan update. City Archeologist Kay Hines says the changes will make the park more inviting. 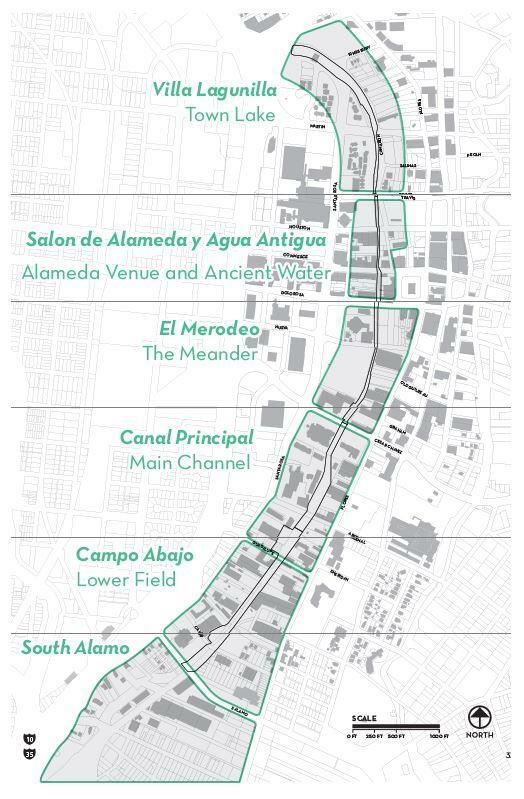 We’ve been looking at the San Pedro Creek Project from north to south, and now we’re down to its last section, called Campo Abajo, or the Lower Field. This stretch goes from Guadalupe Street to South Alamo. "There’s already economic development happening," said San Antonio River Authority’s Suzanne Scott about the area. "The new Kipp Academy is going to be located in this stretch and we’ve already been in conversations with them about having educational opportunities for the kids." Bexar County has put aside $125 million to completely re-do a two-mile stretch of downtown’s San Pedro Creek. I've been looking at the plan in detail, and it is pretty amazing. Currently the creek is a concrete drainage ditch, but what designers and engineers have imagined is something that looks a bit like a narrower Museum Reach. The original reasoning for the project is flood control and water quality improvements; both to be accomplished through an underground overflow tunnel, with the added cleansing benefit that re-circulated water is pumped from it.